Three months ago I had an operation to remove a benign tumour on my pituitary gland. The tumour was pumping out growth hormone, and so giving me the condition of Acromegaly. 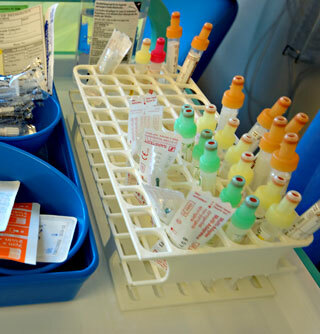 Blood sample containers. Marvellous little things. A few days after the operation I had some blood tests to determine if I was in “remission” or not. Basically it was to see if I had an elevation of Growth Hormone (GH) or not. The results indicated that it was likely that I was in remission from the values of GH alone. The results were very early, but research has shown that these early results are a good indicator of remission. The real thing that causes growth isn’t directly GH, but rather IGF-1. In a previous posting I wrote about these IGF-1 values still being high at 325 ug/ml and a month later, 295 ug/ml. The figure we were looking for was a value of less than 267 ug/ml. The values appeared to be dropping though. Two weeks ago I had a set of blood tests. This will be for three months after the operation. There are numerous medical papers that document that normalisation of IGF-1 at three months, and normal GH indicates remission from acromegaly. Remission is of course the closest thing to ‘cure’ in the land of tumours. Today I got the results. IGF-1 was 220 ug/ml (well within normal range). Indeed, everything is in normal range. I’ve been ‘cured’ of acromegaly. Absolutely wonderful news! Whoohoo! That is great news. My husband had Transphenoidal surgery on 1/27/2010 w/ Dr. Laws in Boston at Brigham and Women’s. His IGF1 was 81 at week six and bounced back to 196 at week 12. We are not sure what to think of this. His normal range is 60 to 184 based on his age of 73 (he is a young 73-year old). He still feels exhausted, and he has actually gained weight since his surgery. We are having the IGF1 retested on Monday to see if there was a problem w/ the lab. Could be?? Anyway, I am happy to know that you are in remission. Many thanks for your comment. It sounds like your husband is doing well. It’s quite normal for IGF-1 values to fluctuate after surgery. There is an accepted error range for these tests (this varies lab to lab, or rather what ELISA kit they are using). 196 and 184 are within 5% of each other, after all – which is the kind of error you’d see in the test anyway. I’m guessing he’s had his cortisol levels and other hormones checked too, if not, the exhaustion could be a small imbalance there. Anyhow, I hope your husband carries on making great progress and that his strength builds up so you can both go out and about and enjoy life to the full! I read your blog fully as I couldn’t remember if you’d had injections after your surgery, but can see here that you haven’t. I’m so happy for you Trys, your early results are so promising, you must be so relieved that you can put Acro behind you for a while and focus on just living your life to the full again. The surgeons are just so gifted aren’t they, we are so lucky to have found such experienced surgeons, who have literally handed us our good health back again. My endo warned me that the tumour would eventually grow back, but said it could take many years before it gave me any more trouble, if at all. The good thing is that we’ll be monitored and will also know the warning signs ourself. I wish you continued good health Trys – once again fantastic news. Thanks for your comment. Yes, we are so fortunate to be living in such an incredible age of developments where we can find remission for this condition. It’s exciting to read your posting again on your good news of remission on DailyStrength too! There is good research on early postoperative (ie. same week), combined with the three-month postoperative tests as an indicator of long term remission. Other prognostic indicators are the GH value pre-treatment, and Prolactin co-secretion. Research papers show that the likelihood of recurrence after remission runs at approximately 15%. So, in other words, for 85% of us, remission is indeed “long-term remission” and is the end of the story. The condition does not necessarily come back. (I blogged on similar in my article called “In Limbo land”). It was amazing that even a few days after the op, my Growth Hormone level suppressed to less than 0.1 ug/L, my day curve was all below threshold. The surgeon himself said that it wasn’t a “borderline”, result but was clearly one that showed remission. Very exciting, but I wasn’t content on this until this three-month test validated the results. I’m delighted! It’s important from a “moving on” perspective to not dwell on the 15% chance of it coming back, rather it’s best to move forward on the 85% likelihood of it not coming back. Situations are naturally unique to each person, but in most people the tumour does not grow back if tests show remission. This hopefully should be of encouragement to yourself too! Great isn’t it?! Anyhow, I’m concentrating now on getting myself fitter. I’ve been cycling a few times this week, and I’m saddle-sore. I’m quite unfit, and I’ve over done it! I think I’ll do some swimming next week along with the cycle to try and vary what I’m doing a bit! That’s really great news Trys and something that I hadn’t read about. I’d tried not to get my hopes up too high and even think about the possibility of being in remission for life, but having read what you’d written, there must be a real possibility of that! That’s just fantastic news! I’d told myself that I should relish the time that I’ve got now, which is free from the disease, but prepare myself for the inevitable of it growing again, especially as my endo had told me to be prepared for. I’ve definitely had lots more energy than before my operation and am now playing netball and squash two or three times a week, where as before I did absolutely nothing apart from walking the dog at the weekends. I’ve had to do more exercise though, as I seem to be unable to shift the weight that I’ve put on over the last year and am finding it hard to diet as I’m always hungry! GREAT news! You are a shining star of hope for us all. Also great that you are focusing on your fitness and working out! You’re on such a good road to health. Thanks for sharing all your news with us! Great news about the successful surgery and subsequent remission. May your progress continue.